by Dave from The Longest Way Home ~ January 3rd, 2019. Published in: Travel blog » Nepal. I hitched a lift with a friend of mine who has been involved in supporting a local children’s home with children aged from 7 to 20 outside of Kathmandu. I’d been there several years ago after the earthquake. Things had improved. At first in typical Nepali, or should I write child like manner, they were shy. Preferring to sit in the sun after briefly picking up my donated guidebooks to Nepal in respectful curiosity. 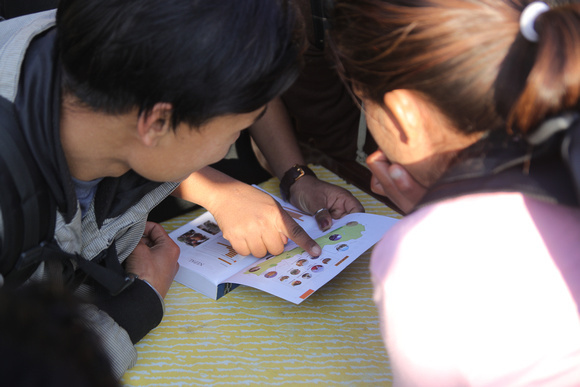 The maps at the back of the book were soon spotted though and became the biggest attraction. They wanted to see where their hometowns were. And indeed they found their villages on the maps. I was asked if this and that village were in the book. I didn’t want to disappoint but at the same time the small remote villages that had abandoned them as youngsters didn’t always appeal in a tourists guide to a country. My Nepali friend interjected when necessary and let them know that the next town was in the book and their eyes lit up satisfactorily. 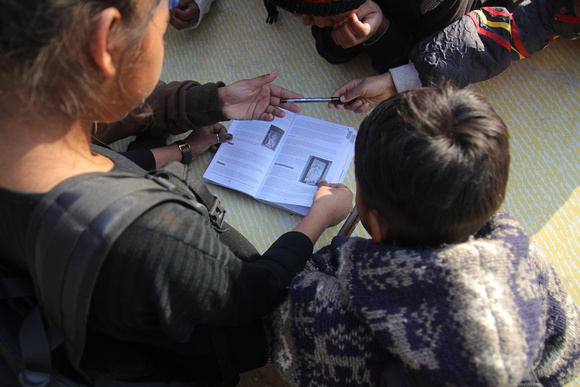 In Nepal English reading is mandatory at school. That didn’t always mean people could read English though. So I asked politely as the children continued to point at maps. A young teenager waggled his head dismissively and then went about reading the first page, repeatedly. I was witnessing the curse of modern day education in Nepal. The necessity of rote learning. Reading to memorize and then write it out word for word without understanding. One of the very things that this book was not for. The question was now about which child still had “that” spark of curiosity to break the mold. The start of Nepal is rather exciting. It begins with a valley of water, a Buddha, a lotus flower and then a legend of a man with a sword. A valley of kings and queens, a war of beautiful art and then a bevy of democracy, communism and of course what the world has today. She began reading on her own. Excited when her finger ran over some of the words I’d just spoken. Manjushree. 3,000 years ago. The Malla Kings. The curious girl with no parents smiled as she read on. 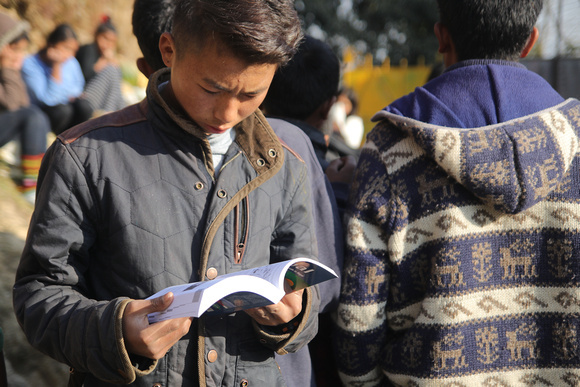 On the other side of the compound a boy was reading about Nuwakot, where he once lived. Other boys began to surround him. Nuwakot is currently under re-construction. I pointed out that his home town was there long before Nepal existed. They cooed. Pointed to the Nuwakot palace and then the boy pointed to himself with pride. If there’s one thing being a “foreigner” fails at it in a place deemed to be still developing. That’s quite simply being raised up on a pedestal as being better and having more. While I was instantly respected for having written a book there was of course this assumption that comes with being a “foreigner”. Then this boy discovered his former home town in the guidebook …. A boy asked how much I sold the book for. A tricky question that is best avoided because no matter your answer it will be taken up incorrectly. I answered by honestly telling him that I did not sell any today. So I had to use yesterdays money to buy porridge for breakfast and cook it in my room. I explained that one packet of porridge was 110 rupees and could last me a week. The children nodded. I then followed up by saying if I ate in a restaurant I would have to pay nearly 400 rupees! I could not afford that. Just like when I was their age I only ate pasta and fish for nearly a year because I didn’t have enough money for more. They waggled their heads in understanding. “So why did you write this book?” a young boy asked. “Why do you think?” I replied as a five minute question and answer session began. The message of learning knowledge is rarely spoken about in travel guidebooks …. I wonder why? “To sell the book?” finally a boy was on to something. “To make money?” replied another. High five. He got it. They got it! Smiles ensued. “Who taught you to write this book?” Came the next question. “I taught myself” I replied. Light bulbs lit up before me. The day had just become better. We delved into the book. Instead of knowing just the name of a place they could learn where it was, how it came to be and what to do there. Strangely there is a common question in Nepal. One the education system doesn’t prepare people for. I used it as an example if they needed a job. A “boss” in Nepal will often ask someone if they know about his hometown. Particularly if it is deemed “famous”. With the knowledge in this book they could impress him more than someone who only knew where the town was on a map. Now they could tell him where it was, why it was famous, how to get there, what to see and even where people could stay or eat! When the first edition of my Nepal guidebook was published last year many things happened. To jump ahead a little, my publisher sold every copy! In other words the book sold out completely. It’s still in bookshops and they want more. But the publisher house has no more stock. However, I did have a reserve box of books for international shipping locked up in a store. There’s a chain effect as one person showed an interest in reading about the oldest inscription in Nepal the others joined in …. Normally international book post is what’s used to send them overseas. This box was put away for the inevitable Nepal airline / post office strike that did indeed happen during the year. We could keep sending books out via courier options as bureaucracy ground to halt. With this reserve box of books still hidden I now had a choice … sell them or do what I wanted to do last year. Help to show local Nepali people what their country is really like by donating them to schools and libraries. I wrote the book. Took all the photographs. Made the maps / diagrams, researched it etc. Today I publish the most up-to-date digital guidebooks to Nepal in the world. Himalayan Travel Guides is a guidebook publisher who publishes the paperback version. You can read all about those stories here From digital ink to paper print. The best paperback guidebook to Nepal. The Guidebook book launch. It was and still is a great learning curve to work with a publisher and a lot more complicated than it seems. One of the first things I wanted at the start was for the book to be printed in Nepal. My publisher is in Nepal, so that was the easiest step. Yes, I could have cashed in with another publisher, but considering the book is about Nepal … it made sense to help employ local people. The side bonus to this is that it was the first and is the only guidebook in the world printed on recycled paper! So thumbs up on local employment and the environment. The next big lesson was when your publisher shows you the ten mis-prints from the first printing press. The books with skewed text or bubble lamination. Not suitable for sale. They were still readable, but not suitable for sale. I wanted to give them away but my publisher insisted it was better to send them for recycling. Things would come full circle by the end of 2018. Now 1.5 years later we’ve sold out of books. My guidebook to Nepal became the national best selling guidebook to Nepal. Another guidebook publisher tried to follow up a year later with a very similar cover – but they had already lost the number one spot in Nepal. The fact that one of the largest publishers in the world felt threatened enough to do this was welcomed by me as a pat on the back. The whole “flattery is the best compliment” saying held true. Moreover, customers in bookshops saw it too. So now with all books sold out and my publisher clamoring for a new edition I could either sell off my hidden reserve stock or … donate them. I think you know what I chose to do. I’ve written about the problems of volunteering in Nepal. I’ve previously worked in developing sustainability programs around the world. I don’t particularly believe in donating to Nepali schools or orphanages. 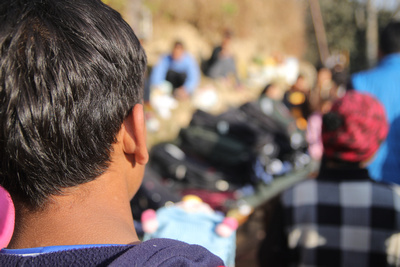 Handing out clothes, pens or worse yet money has led to many people becoming both dependent on “hand outs” and in many cases Nepali or NGOs profiteering from the innocent. However, there’s one thing I don’t object to. And that’s books. In particular non-curriculum based books. The type of books that are filled with information and knowledge that can inspire and educate. This photograph reveal the moment when a young girl discovers the “famous” places in her country that she never visited or knew about …. despite living close to them. Having grown up with very little I remember very well frequenting second hand book shops in search of books and magazines with information I could learn from. A book is knowledge and this knowledge to the underprivileged gives one the power to both escape a situation or indeed learn to overcome obstacles leading to something better in life. For me this box of print guidebooks held something more than just $25 books. It held knowledge that could educate, inspire or indeed help someone. If just one child could learn from this book then it was worth more than every book sold. Well, if you know anything about the print industry there’s not much profit in print to begin with… but you get the idea! Print guidebooks get out of date. I won’t get into the virtues of using an out of date print book. In my case the book is still far more up-to-date than the big publishing house books. Indeed my digital guidebook to Nepal is as up-to-date as this week. Guaranteed. You really can’t get better. Nevertheless there are many people out there who prefer print. I get this and respect this. My publisher asked for an updated print book rather than just printing off a second print of the older book. There’s something rather special coming soon. More on that as it happens. For now this is where you can grab the best and most up-to-date guidebooks to Nepal which in turn helps me prepare the paperback version. It’s all full circle here! But back to the purpose of a guidebook beyond a travelers lifespan for visiting a country. In Nepali society the children I visited are sadly not looked upon as being of great worth. They will have a harder struggle to succeed and climb to the top of their mountain in life than others. Few in their society believes in them. I remember this struggle well. On my visit to the school we shared this bond of being reluctant outcasts from the start of life. For me I embraced it. I grew up surrounded by people telling me I was a failure and not wanted. For every negative word they said I didn’t get knocked back. I grew stronger. I learned and taught myself more and more about the world. I proved them wrong. For these children they will need to choose their own path in life. But no matter the path, with the desire for knowledge beyond the text book of a depleted curriculum, they may well climb the mountains of life that are often far taller than Everest. They are already survivors. Tomorrow they can be heroes. Today we witnessed part of this. If just one child can aspire to something greater than what they were born into then something good has happened in the world. Get my Guidebooks to Nepal & discover more than anyone else! Looking for more insider tips and information like this? Get the most up-to-date, popular and dedicated guidebook to Nepal in the world. Over 550 pages & 900+ photographs of every temple listed, daily guides on all the treks listed and so much more. Great work by you on all accounts. Thank you for such an amazing story. Just bought one of your books. Hope it brings you more than porridge tomorrow! Great story. Wonderful initiative by you. It’s better than throwing them in a recycle bin that may never get used. Just wanted to say hat’s off to you. I know you don’t write everyday about your story anymore but this was a sharp reminder about why it’s still the most inspiring out there. Thanks for the kind words Amy. This is also a great idea for travelers who want to leave their guidebooks behind. Indeed it is. Better than leaving them in a hostel for sure. Well done for this. 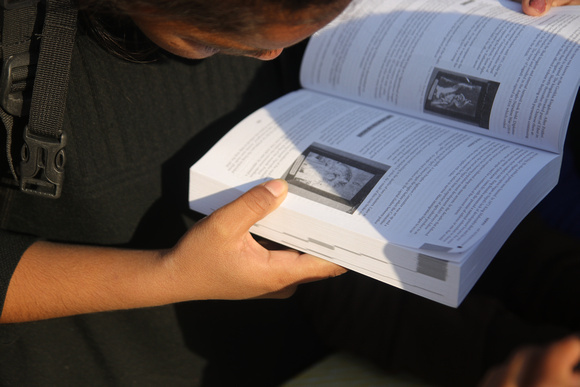 Knowledge through old guidebooks for school children is a great idea. Surprised other publishers have not been doing the same. Read the but about them copying your cover…. Don’t be surprised if they do the same with books next year. I can’t answer for other publishers. More effort and cost for them. Similar to coming up with an original cover! Awesome idea! So great to have people like you in the world. Thanks for the kind words Karla!